A couple of weeks back I got my hands on a new set of trekking poles, the Black Diamond Alpine Carbon Cork Trekking Poles to be precise, and after a few outings in the hills with them, I thought it was time to add up a review of my experience with them on the site. The Alpine Carbon Cork trekking poles from Black Diamond are a top notch set of trekking poles. They are good for any kind of hiking, all year round so should meet the needs of most, if not all, hikers. 4 Season trekking poles that are good for all types of hiking e.g. day hiking, backpacking, etc. The Alpine Carbon Cork Trekking poles are a very practical, sleek and easy to use set of trekking poles. They have a range of 62.5cm to 130cm (25" to 51") , which should work for practically all hikers. The Black Diamond Carbon Cork Trekking Poles are 4 season trekking poles and so are good for use any time of year. They retail at $169.95, so not the cheapest option on the market, but you should get a deal if you shop around. As best as I can tell, they come in one color, Black/White and they have all the features and specifications I would look for in a set of trekking poles. If you're new to trekking poles, I suggest you read this post on why I think trekking poles are a good investment if you're planning on doing a lot of hiking. The hand grips of the poles are of course, as per the name, made from cork. They are very comfortable and fit well into my hands. Cork is my preferred material for trekking pole handles, I much prefer it to plastic or rubber. The hand grip also features a 360 degree sewn strap, as shown in the image below, for wrapping around your hand. I tend to avoid using these as I always fear that if my pole got stuck and I slipped with my hand still in the straps, it could lead to a nasty injury. That could just be me being paranoid though 🙂 and the Carbide tips, referred to in more detail below, are designed to break off given too much pressure, but I still prefer to avoid a potentially flailing pole. Having tested them though, I can say that the straps are sturdy, functional and secure, so if you like to use them, they will work well. The poles also feature an extended non-slip EVA foam grip extension just below the handles. These are used for quick height adjustment as you hike without adjusting the flick locks. The grip extension makes this really easy to do. You can see these just below the handle proper in the image below. The idea behind for this is that say you're hiking down very uneven terrain and you need to keep re-accommodating the length of the pole as you walk. You can simply slide your hand down from the handle proper to this secondary handle area. This gives you a nice length to work with without having to fiddle with readjustments while trying to negotiate tricky terrain or having to grab the shaft. A cool idea for sure! The poles also feature Black Diamonds Flex tech tips which are designed in such a way as to break away if you get caught in something. The tips are fully replaceable which is also a great to have in terms of longevity of your poles. they can also be swapped out to the rubber tech tips from Black Diamond (sold separately) if you prefer them. The tips also feature small baskets, the circular attachments in the picture above, that help ensure your poles don't go too far into the ground. The poles also come with wider powder baskets, see the image below, which can be easily attached by screwing them on to the poles. Good for hiking in snow and that type of thing. The pole height is adjusted by using a flicklock locking mechanism. You simply open the lock, and adjust the pole to your desired height. The fliplock mechanism features a stainless steel construction and a low profile, dual axle design providing serious clamping force, so you can be sure your poles will hold out under pressure. The fliplock mechanism is very easy to use and the stability provided in the poles by the locks is really excellent! As referenced above, the trekking pole has height guide marks on it so it’s easy to get the same desired height on both poles. You can see the measurement marks in the photos above and below, as you can see the height adjustment marks are very clearly visible. The poles measure a tidy 63cms (25 ") when fully retracted. A decent size that should fit in any reasonable sized travel bag, so taking on a hiking trip or adventure should never be a problem. To give a visual idea of size, the photo below shows the fully retracted poles with a standard sized tin of chopped tomatoes beside it, to give an idea of proportion. The Black Diamond Alpine Carbon Cork trekking poles weigh in at 490g (for the pair). I have found the weight to be very good, and not uncomfortable when I am not using them and just carrying them in my hands. They are solid enough though to know you’ve something sturdy in your hands, which is a good thing. Gives you confidence to apply load bearing on tricky terrain. They retail at the higher end of the scale when it comes to trekking poles, but if you shop around you’ll get a deal. If you click on the red button or the link in the table at the start of this review you will be taken you to Amazon where you will get a few good price options. Overall, I think the price is good for what you get i.e. 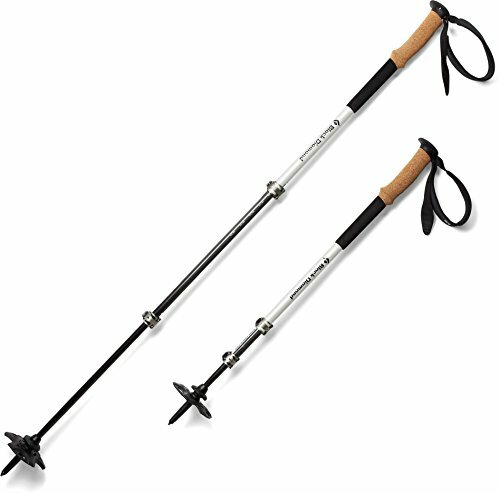 very functional trekking poles and good value. As of the date of this post, from about 50+ reviews across multiple sites, 95% gave the The Black Diamond Alpine Carbon Cork Trekking Poles 3 stars (out of 5) or more, 89% 4 stars or more and 79% gave 5 stars so some decent scores overall. I'm happy giving them a 4.5 out of 5! I hope you found this review of the Black Diamond Alpine Carbon Cork Trekking Poles useful. I am a very happy customer to date, and I have been very happy with hoe they have performed when out on the trail. Granted it is early enough in their lifetime but everything about them so far tells me, I’ve made a really good purchase and one that will see me getting many years of excellent use out of them. If you’re unsure about getting trekking poles, check out the top 5 reasons why you should buy trekking poles. They are an excellent addition to your hiking gear checklist, that is for sure!